There's already plenty of anticipation for Samsung's foldable smartphone, but there's nothing like a briefly uploaded YouTube video to stoke the flames a bit. It seems that Samsung Vietnam mistakenly uploaded a teaser video showing off a handful of already-here and concept technologies, including a brief glimpse of a handsome foldable phone. But before you get too excited, there's reason for skepticism here. The main cause for a raised eyebrow is that outer screen, which Samsung officially calls the "cover display." 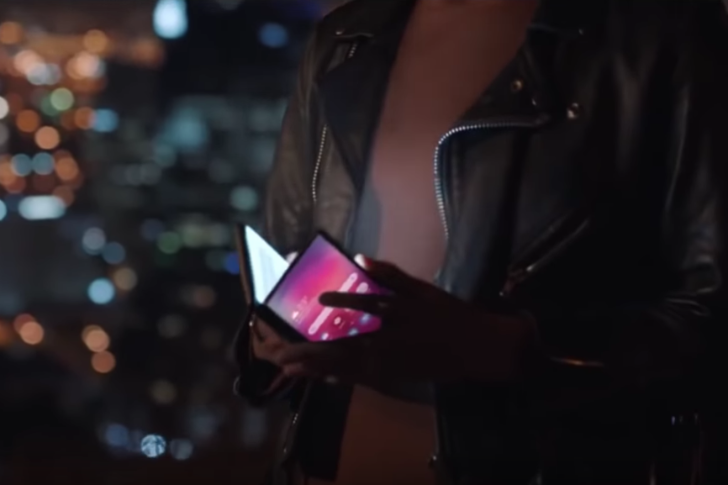 The one in the video, which has since been taken down from Samsung Vietnam's YouTube account (but not from other channels that have uploaded "backups" for posterity), is much larger than the one we saw when Samsung gave the world a dim look at a demo version of the foldable phone housed in a box back in early November. That device's cover display was quite tiny compared with the one we see in the teaser video, which nearly fills out the front of the phone. The cover display on Samsung's foldable phone, as seen in November 2018. We know the 4.58-inch, 840 x 1960 cover display on Samsung's foldable phone will be noticeably shorter than the 7.3-inch, 1536 x 2152 tablet display on the inside of the device. In the teaser video, the cover display appears to be just about the same height as the larger tablet display on the inside. 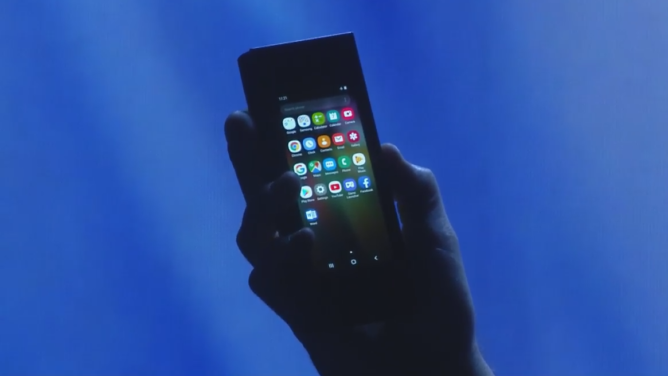 Add to this the fact that the video comprises a mix of current hardware (Galaxy Note 9) and concept technology (a gesture-controlled mirror and an attachment that turns a Note 9 into an ultrasound device, among others), and there's good reason to consider the foldable phone seen here as part of the latter group. So, yes, rein in your expectations when it comes to just how polished Samsung's functional (but probably not market ready) foldable phone will look when it's expected to be unveiled alongside the Galaxy S10 at the company's Unpacked event on February 20th in San Francisco. And if you're curious, we've been told that the Vietnamese text at the end of the video roughly translates to: "Innovations we've created today so you can make a difference tomorrow." In a release today, Samsung also explains that the video kick-starts a yearlong brand campaign celebrating 10 years of Galaxy smartphones and looking forward to 10 more years of creating innovative products. The company explains that the video "highlights potential breakthrough technologies – including seamless multi-device experiences, artificial intelligence, and radical new displays – and teases Samsung’s 5G products and foldable display technology to be launched later this year."